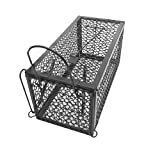 For an easy way to catch rats without killing them, use the Rat Cage Trap from haopd,Suitable for use indoors and out, it can be used in homes, on farms or in commercial premises. Safe to use where children and pets are present. the trap doesn’t use any poison or snap traps – the rats are simply lured into the trap and are then caught, unable to get out again. The solid top and carrier handle makes it cage easy for transportation – once caught, take the cage at least three miles away and humanely release the live rats into the wild. Remove and discard metal tie holding setting arm. Position the cage trap wherever evidence of rats or other nuisance animals is seen. To set, push in thumb plate on door and lift open using handle at bottom. Carefully position setting arm hook into loop on door using setting arm handle on top of cage. Once the trap is properly set the setting arm will be in a perpendicular position and bottom of it will rest adjacent to the treadle. Reach into the cage trap and place bait on the bait well at the centre of the treadle see bait recommendation below. We recommend using Mouse and Rat Attractant from haopd. Captured animals can be safely transported by lifting the cage using the carrier handle. Mouse Cage Trap, 240 x 115 x 115 mm. This entry was posted in Small Animals and tagged 240X115X115MM, Animal, Cage, CageMouse, Catcher, HamsterMole, Humane, Live, More, Mouse, RODENT, rodents, Small, Trap, WARKHOME, WeaselGopherSquirrel by One Boutique. Bookmark the permalink.